From her part in huge films such as Clash Of The Titans and Love Actually to the revered British comedies of That Mitchell and Webb Look, Dead Ringers, Absolutely Fabulous, Peep Show and The Armstrong and Miller Show, to the more recent excellent British dramas A Young Doctor's Notebook and The Last Kingdom, Kate Benton has long been a solid part of British TV and film history having worked on many British classics. Nominated for an Emmy, BAFTA and RTS awards no less than eight times, Kate is known for her wonderful makeup designs and producing major transformations with makeup, prosthetics and hair. Kate also owns PAM (with Makeup Artist Jan Sewell), one of the leading professional makeup supply shops in the UK. PAM's motto is to never stop learning and they try to bring everything they learn on set onto the shop's website to share with other artists. Recently finished working on the brilliant The Last Kingdom, Kate took the time to tell me a little about her career, her highlights, give her best tips and of course share her favourite products. MANW: How did you start your career and what was the progression it took? KB: I was lucky enough to start at the BBC makeup school (when they had one) and I got an excellent training there. After ten years I left and went freelance, and then I started PAM (Precious About Makeup makeup store) to allow everyone access to both the knowledge and the products we use on set on films and TV. MANW: You mainly work as a hair & makeup department head in TV, did you ever want to work in fashion or beauty? KB: No. Most of my work tends toward the wig/prosthetic/casualty side of makeup, it's what I really love. Having said that, doing Elizabeth Hurley on the last two seasons of the Royals was straight beauty and great fun. MANW: Do you have a preference for the type of jobs and make-ups you like to do? Do you prefer hair or makeup? and do you prefer straight or effects makeup? KB: Last year I did a Viking drama for BBC America called The Last Kingdom. There were battles, beards, decapitations galore and I can honestly say it's been one of my favourite jobs. Ditto A Young Doctors Notebook with Daniel Radcliffe and Jon Hamm, which was period, blood and gore and snow all mixed together. I like being very busy! I genuinely like doing both and find it very strange and sterile when I am limited to either one or the other. 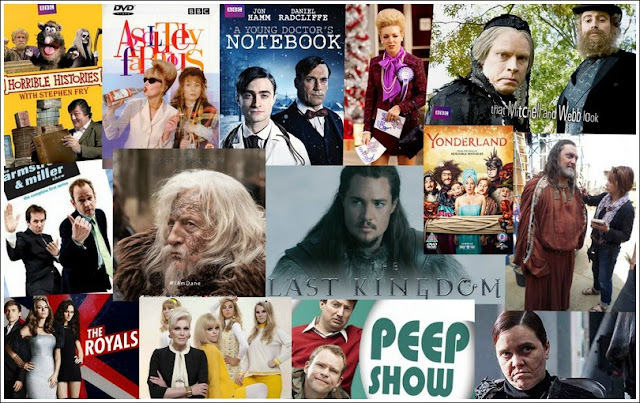 MANW: Over the years you designed on a lot of sketch comedy shows, as well as plenty of serious drama character work (The Last Kingdom was fantastic hair & makeup). What is your process of creating character looks and how much say do you have in the designs? KB: Honestly I loved doing comedy. The joke in comedy so often relies on the makeup department for the visual gag so it can be fantastic fun to design looks to either make or re-inforce the joke. In drama it's more refined and possibly more pressurised. On the Last Kingdom the initial looks were dictated by the director who banned the use of wigs and lace beards, so we had to up our skills to do wefts, extensions and laid on hair. It was also a great mix of factual, like the sharpened teeth for Skorpa the warlord, and modern interpretation with tattoos and hairstyles. MANW: You have worked on some brilliant TV shows, That Mitchell and Webb Look, Armstrong & Miller, Ab Fab, Peep Show. Can you tell us about some of the stand out moments of your career? KB: Working with amazing actors and crew is what makes it such a fab job. Recently I worked closely with Alexander Dreymon, the lead in the Last Kingdom, which was lovely, and my daughter was also the script supervisor so we were in Budapest together for six months. MANW: You've been in the industry a long time, how do you think it has differed and what advice would you give to new artists starting out? KB: Yes I have seen many changes. I think it's both tougher now and also easier to move up quicker! Tougher as so many people want to get there, but there are no set rules so if you get a lucky break you can shoot up the ladder very quickly. MANW: All artists have 'the wish list'; a face they would love to work on or a show or film they would have loved to have worked on. I would have loved to have worked on This is England, Catherine Scoble's 80's period designs have long been a favourite of mine, and The Mighty Boosh is another, it had such incredible makeups by Christine Cant. Who or what are yours? KB: Good choices!! Both of these makeup artists have also been long time favourites of mine. I honestly love Jan Sewell's (co-owner of PAM) work, I used to be her trainee at the BBC, she is technically brilliant and I predict she might well be in the oscar nominations for her work with Eddie Redmayne on Danish Girl. I like doing big changes so to have worked on something like the Danish Girl, that Jan designed, would have been a favourite, partly because of Eddie Redmayne (enough said) and partly because the makeup and hair is so crucial to the story. Or a big epic like Gone With The Wind would have been great, just for sheer scale. MANW: On to the good stuff, what are your tricks for flawless looking skin? KB: I have to say it's Le Maquillage, they are the industries favourite base and the reason why we opened PAM all these years ago. They are the only wax foundation on the market and pretty amazing. MANW: What are your top 5 holy grail kit products? KB: Le Maquillage grande palette, Triple masque, Make Up For Ever primer, Benetint and Louise Young eyeshadow palette. MANW: What's your best makeup artist tip to give women? KB: Less is more. This tip is more important the older you get!! MANW: Finally, false eyelashes - the longer the better or enough already they look ridiculous? KB: I just recently discovered the Kiss Lashes and we are trying to get them into the shop to sell. They are amazing and in the outer corner of the eye work so well. I think it's hysterical when you see the really strong heavy almost panto lashes on, they close the eye up instead of opening it! We also sell Velour lashes which are dark but soft and fine and lovely natural looking. For more info on Kate you can see her IMDB page here, follow Kate on Twitter here and shop at PAM here. If you liked this interview and would like to read other leading industry makeup artists stories have a look at the rest of the series here. HAVE YOU SEEN MY BIG CHRISTMAS GIVEAWAY? You can follow me on Twitter here and Instagram here (@anniemakeup). CHRISTMAS GIVE-AWAY: EVERY WEEK UP TO CHRISTMAS! MAC FLUIDLINE GEL EYELINER GIVEAWAY! All content © Make Art Not War unless stated otherwise. Please seek permission before use. Awesome Inc. theme. Powered by Blogger.